It may sound crazy, but a lot of people wash their hair wrong. 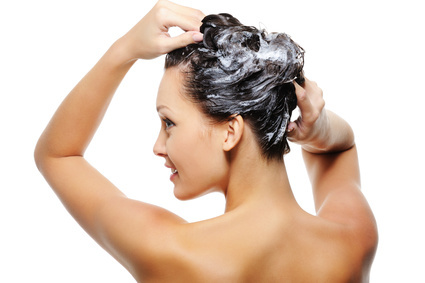 By washing your hair in the wrong way you can damage your scalp and hair, so you can be hair thinning or even fall out. A good method is very important. Brush your hair before showering. This prevents buttons and makes it easier for showering. Use a good shampoo. For men, an amount the size of a coin usually enough. Do not be too rough and use sufficient (not too hot) water here. After the shampoo is rinsed well apply your conditioner. Be careful when applying your hair. Use your fingers to prevent damage. Wash out the conditioner thoroughly. Use enough water. It is important that there is nothing left behind. It is best to finish with cold water. This way you get hair more shine and resilience. Make sure you dry hair properly, but take your time. Never rub the towel on your hair but “pat” dry. Then let your hair air dry. If you are in a hurry, you can use a hair dryer, but keep in mind that this can dry out hair. If possible do not usen a blow dryer too often. Take your time to wash and dry your hair. Handle it carefully and do not be too rough. Do you have any tips to care for your hair? Then let us know! Revita.COR is a high-quality conditioner, made by DS Laboratories. Below we provide answers to frequently asked questions. How can stem cells in Revita.COR help develop new hair follicles? Stem cells can develop into any tissue, and normal hair follicles maintain reserves of those cells. To repair damaged follicles used Revita.COR plant stem. These exhibit many of the same properties and plasticity as human cells. Does Revita.COR nourishes the hair follicles? Revita.COR contains various ingredients with nutritional properties: arginine, a metabolic precursor of nitric oxide, citrulline, an amino acid, inositol, a cyclic alcohol of which a deficiency has been linked to baldness, lupine extract, rich in peptides and vitamins, and tyrosine, an amino acid that plasma transmission increases. Yes, the conditioner contains only ingredients that are safe for topical use, Above all, they improve the overall condition of the scalp. For who is Revita.COR intended? Any man or woman who is worried about thinning hair can benefit from this conditioner. The perfect candidate is someone who has only just start experiencing thin hair; because it is easier to keep existing hair than to grow it back. What results can I expect from Revita.COR? The advantages of this conditioner are visible within a few days. Depending on the duration and degree of thinning may take several weeks to months to notice the revitalizing effect. Can I use Revita.COR with topicals, such nanoxidil? Yes, this conditioner does not respond to other topicals; it is safe to use. How long should I use Revita.COR? Once the desired result is achieved you should continue using the conditioner to maintain the condition of the hair and scalp healthy. Does Revita.COR have side effects? No, as long as you use it according to instructions. All the ingredients have been extensively tested for safety. Some might even take you safely. Does Revita.COR also works for women? Yes, her problems in women are similar to those of men. Normally, estrogen protects the hair follicle of the many devastating effects of DHT. Thinning of the hair can vary with the levels of estrogen and DHT. This conditioner helps protect along the hair follicles of DHT, which enter, resulting in thicker, fuller and healthier hair. How do the active ingredients from Revita.COR attach to the scalp? The compounds are encapsulated in hydrophobic, bio-adhesive, cationically charged microspheres; that is intractable to the scalp hechten.Dit system ensures that the ingredients remain effective long for maximum effect, even while sweating and swimming. Note: Some of these answers have been translated from English and comes from the original manufacturer.